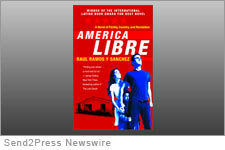 SAN DIEGO, Calif. /California Newswire/ — Author Raul Ramos y Sanchez is touring Southern California, the setting of his controversial debut novel AMERICA LIBRE following its July 29th release by Grand Central Publishing (formerly Warner Books). The apocalyptic story, which envisions an armed Latino insurrection in the U.S. Southwest sparked by a violent anti-immigration backlash, has already gained considerable media attention from print and broadcast sources including USA Today, CNN en Espanol, Mexican news service Notimex, nationally-distributed magazines Alma and Latina, and a number of local radio and print sources. AMERICA LIBRE (ISBN 978-0446507752) is a cautionary tale of a near-future where once-peaceful immigration rallies explode into riots against the violence of self-appointed border patrols and urban vigilante shootings. As the violence escalates, the U.S. Southwest becomes embroiled in a war of liberation led by Latino insurgents. Amid the chaos in his L.A. barrio, decorated Afghan vet Manolo Suarez finds himself romantically drawn to a Latina radical activist, threatening his marriage, his family – and his loyalty to his country. Along with its timely premise, the novel has also garnered literary praise. A 2008 International Latino Book Award winner, AMERICA LIBRE has been called “thrilling and vibrant” by New York Times best-selling author James Rollins and a “sweeping, intense novel of extremism, fear and consequences” by Publishers Weekly. The novel has also built a considerable grassroots following on the Internet in scores of blog reviews and interviews and is a popular subject on Twitter. Interest in the novel has spread to academic circles. Ramos will be presented at several area colleges by the AMERICA LIBRE Committee headed by Dr. Jess Nieto, Professor of Chicano & Latino Studies at California State University Long Beach. Ramos will also lead two workshops for authors at the Southern California Writers Conference September 25-27. Vroman’s Bookstore – Pasadena, CA – September 21, 2009, 7 p.m.
Libreria Martinez – Santa Ana, CA – September 23, 2009, 7:30 p.m. Mysterious Galaxy Books – San Diego, CA – September 24, 2009, 7 p.m.
With President Obama’s recent vow of a sweeping overhaul of the nation’s immigration system by early next year, the significance of the novel increases. “When I began writing America Libre in 2004, some thought the book’s premise was unrealistic,” the author explained. “An uprising by Hispanics? The idea seemed far-fetched, they said. Today, with the rhetoric over immigration growing more heated each day and hate crimes against Latinos on the rise, the skeptics are no longer so certain.” Ramos believes the novel is a wake-up call to the dangers of extremism – on both sides of this explosive issue. You Tube Video (0:48) http://www.youtube.com/watch?v=N6iV6H9fZnk . Grand Central Publishing, formerly Warner Books, came into existence in 1970 when Warner Communications acquired the Paperback Library, subsequently publishing paperback reprints editions of such bestsellers as Harper Lee’s “To Kill A Mockingbird,” and Umberto Eco’s “The Name Of The Rose.” Today Grand Central Publishing reaches a diverse audience through hardcover, trade paperback and mass market imprints that cater to every kind of reader. For more information, visit www.hachettebookgroup.com. A long-time resident of the U.S. Midwest, Cuban-born Raul Ramos y Sanchez began writing AMERICA LIBRE in 2004 with the input of scholars from Latin America, Spain, and the United States. Besides developing a documentary for public television, Two Americas: The Legacy of our Hemisphere, he is host of MyIimmigrationStory.com – an online forum for the U.S. immigrant community. For more information, visit www.RaulRamos.com.